Photo credit via pexels by Snapwire. Try as we might, some of us just don’t have the patience to sit down and knit. For whatever reason we just can’t master the knitting needle. It’s embarrassing on craft night when all of your friends have their needles poised and at the ready and a project already half complete. Meanwhile, you’re still trying to master the garter stitch. But there’s a way to still join in on the fun and even add something new to girls’ night: arm knitting. Yeah, you read that right, it says ARM knitting. No knitting ability required. Arm knitting is the process of using your arms instead of needles to craft a scarf, poncho, blanket, hat, sweater, etc. It sounds crazy right? 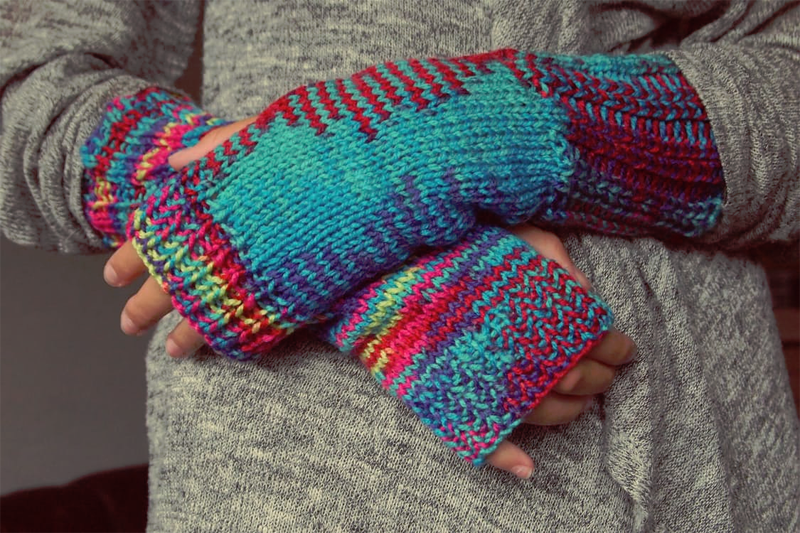 Knitting with your arms instead of needles? Maybe it sounds almost too good to be true. But believe it! This is not an urban legend, this is a TRUE, legitimate technique. But how does it work? Here’s a step-by-step guide into the world of arm knitting. Arm knitting is a simple fashion craft that requires minimal materials and effort. All you need is the yarn! Here’s the thing, arm knitting isn’t an exact science: it’s an art form. No rules, no regulations! So go ahead and pick out that cozy winter white, be bold with bright magenta or stick with classic black. The choice is yours. And hey, if you like what you see, you can always make more! Once you’ve landed on the perfect color (or colors) for your mood, you’re ready to get started. You don’t have to decide now for the blanket, but for other arm knitting fashion crafts like these from A.C. Moore, you may want to have an idea in mind of how much yarn you’ll need before starting. Now, let’s get started on that blanket! The best thickness for arm-knitting yarn is a “super bulky” or chunky yarn, or simply combine 3 skeins of an average-weight yarn. You have the luxury of using the same color yarn for all 3 skeins, or mixing and matching colors. Once you have the yarn as 3 skeins, it is time to determine the width of your blanket and begin knitting. For those of you who knit the old fashioned way, the slip knot will be a part of your knitting vocabulary already. To form the slip knot, separate about a foot of yarn from the bundle. Make a loop with the end of the yarn over the yarn you’ll be working with. Pull the working yarn through the loop, tightly, to secure the slip knot. Slide the loop over your wrist, tail closest to your hand, and working yarn loosely below. You’ll now have two different strands dangling below. One is called the working yarn, and one is the tail. With your other hand, it may be easiest to loop 1 strand over your thumb and the other strand over your index and middle fingers. How large of a blanket you want will determine how many stitches you need to create in the first row. Let’s start with 30 stitches for a good size, comfy blanket. Now the tricky part, casting on. Once you’ve mastered this first row, the knitting of your blanket will be smooth as silk. However, it may take a few tries before you are a pro at casting. Not to worry! You’ll get it. Take your pointer finger from the hand with the slip knot and slide your finger under the looped strand of the opposite thumb. Pull that loop up and over the second loop on your index and middle finger. Then, pull that loop up, making a stitch. Stretch the stitch large enough to make a loop that can fit over your slip knot hand and cast the loop onto your arm. Then, pull the strands to tighten. Tighten them enough to make a solid stitch but loose enough for the stitches to slip down your arm, allowing space for the next 29 stitches. Once you’ve finished with your first row, you’ve also finished with the tail and can move on. Now that you’ve made all your stitches, the fun part begins. Go ahead, throw on that movie you’ve wanted to watch and relax. Take the working yarn with your stitched hand. With the opposite hand, pull one stitch off your arm and pull the working stitch all the way through. This will make a new loop. Slip the opposite hand into the loop. Rinse and repeat with the other 29 stitches. Then do it again back to the other side. Back and forth until you’ve created the number of rows you want for your blanket. You’ve knitted all you can knit and are ready to stop. For your final row, start as you did before with the first two stitches. Then, pull the first stitch (the one farthest away from your wrist) over the second stitch and repeat for the entire row. At the end, cut the yarn and tie a knot to secure. Congratulations! You just made your first blanket! Minimal effort for a lifetime of comfort, not too shabby. The Bandit Lifestyle is a lifestyle blog brought to you by me (Melanie) and my 13-year-old son. We bring the best of travel, products, home, food and entertainment to our audience of women and moms. It's the perfect place to find honest opinions and some fun giveaways too! Learn more about us here. We also love going live on Facebook to share our latest finds with our fans! Be sure you're following us on social so you don't miss out one of our live giveaways or product reviews! Submit your giveaway to our giveaway directory - contests, sweepstakes or giveaways! Plus, we share them with our fans on social media!